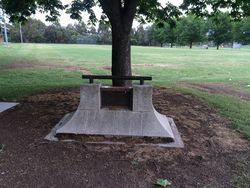 A tree planted in memory of Alderman H. C. Taylor (after whom the park was named), in recognition of his outstanding services to Queanbeyan. Alderman Taylor was a former Mayor of Queanbeyan. The plaque was unveiled at the tree in November 1959. Alderman Henry Charles ("Harry") Taylor, of Kent Road, Queanbeyan, died in Queanbeyan District Hospital yesterday morning after an illness of about four weeks aged 67. 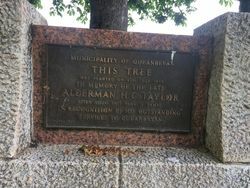 Alderman Taylor was a member of Queanbeyan Municipal Council for 35 years and mayor 13 years, including a continuous period of 11 years from 1940 to 1950 inclusive. He was also the oldest member of the Hospital Board. He was born at Michelago and opened his footwear business in Monaro Street in 1910. Ald. Taylor was the first member of the Queanbeyan Bowling Club. He was also a foundation member of the Queanbeyan Rifle Club and a keen shooter. The Canberra Times (ACT), 7 October 1958.